It has been a busy semester at the Kravis Leadership Institute. From research to workshops, trainings to retreats, our programs have been working to empower CMC students. At KLI, we believe that leaders are made and developed. Our programs focus on building individuals and communities that encourage and develop leadership from the inside-out. We believe that a sense of belonging helps students to express themselves as leaders. Our programs help to create this type of community. 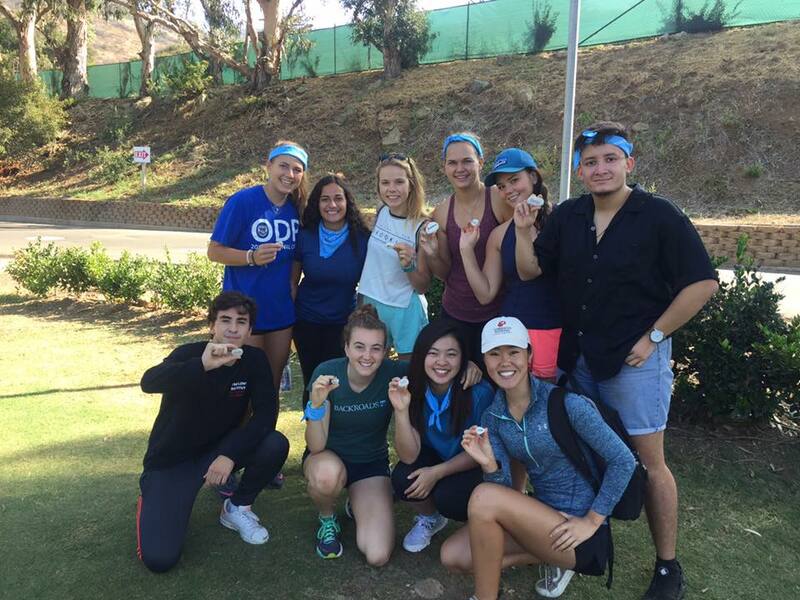 Over the summer, our Programs Team ran comprehensive leadership training for First Year Guide to help them gain the tools to lead Welcome Outdoor Adventure (WOA) group expeditions for the incoming freshman class. After the WOA trips, we extended our reach to the sophomore class through the Sophomore Leadership Experience, an overnight outdoor retreat for sophomores to connect with their classmates and engage in a dialogue surrounding leadership. In addition to class-wide events, KLI worked with CMS winter and fall sports teams to improve team culture and accountability through conflict resolution and communication training. Once the school year began, KLI hosted multiple workshops during ImpactCMC weekend. These panels and workshops gave students the opportunity to connect and learn from KLI Board Members and Kravis Fellows about how to find a meaningful career, as well as learning about how they can be involved in social innovation and entrepreneurship. Our work with social innovation and entrepreneurship extends past dialogue, focusing on taking action. The impACT group brought the Hult Prize, a case competition that challenges student teams to devise pragmatic solutions for the world refugee crisis, to the CMC campus. In addition to the Hult prize, KLI sent six students to the Net Impact Conference in Philadelphia, PA.
“I had the opportunity to learn about Community Development Financial Institutions that provide more secure alternatives to low-income communities instead of payday loans. By the end of the conference, I was truly inspired. I realized that even in a capitalist driven economy, you can run a company that makes a positive impact on the community while still making a profit,” said Biniyam Asnake ‘20. Biniyam Asnake ’20 is also part of a newly trained Social Innovation Consulting Team that has partnered with CMC’s economics department working on a social innovation consulting project. Next semester, the group will further develop its consulting program, and pioneer more social innovation challenges on campus. As we reached mid-semester, KLI offered students a new and unique opportunity: the Passion and Purpose Retreat. Occurring over fall break, the retreat offered an alternative enriching break experience for students to broaden their thinking, explore their passions, and dream up creative solutions to create impact. When fall break came to an end, the Programs Team put together Team Retreat -an overnight program designed to improve the effectiveness of a student organization and tailored to individual team needs. “Team Retreat gave me the opportunity to express myself freely to my softball teammates, and helped to create a community of trust and understanding. I feel more confident asserting myself as a leader both on and off the field,” said Hayley Giffin ‘20. In addition to our programs, KLI gave students the opportunity to engage in unique research opportunities on and off campus. KLI sent five student researchers to Atlanta for the International Leadership Association Conference to present their recent KLI research. Students used their KLI training to compete in a student case competition. While back home at KLI, our dedicated team of researchers continues to work on a variety of studies. “I am currently working on the Fullerton Longitudinal Study (FLS) which is a study that has followed over 100 participants since they were born. Thanks to funding from the Kellogg Foundation, the FLS study is able to re-assess the participants who are now 38 years old. I reach out to participants, and gather surveys,” said Juana Granados ‘18. Other students, work on separate research projects directed by Professor Riggio. Tierra Patmavanu ‘17, Research Manager for Professor Riggio’s team, analyzed data about entrepreneurial leadership for Professor Julie Christian at the University of Birmingham, England. “I have continued to work for Professor Christian in her studies about heroes vs. villains. We are analyzing Robert Lord’s theory of implicit leadership in the context of the Brexit referendum and the recent 2016 U.S. presidential election,” said Tierra Patmavanu ‘17. During the semester, another team of researchers helped to edit Professor Ronald Riggio’s new psychology textbook on leadership research. The students collaborated with Professor Riggio to develop relatable models and current examples to include in his book. Meanwhile, our largest team is working on an ongoing longitudinal study called the Undergraduate Leadership Education (ULE) study. This study tracks the leadership development of applicants to CMC at multiple time points in their college and future careers, such as in their applicant, freshman, senior, and alumni years. From this study, a number of projects have arisen to further analyze specific leadership constructs as they relate to the CMC student body. KLI Research Assistant Courtney Chan ‘17 is currently working on one such project. “My project examines the relationship between CMC students’ sense of belonging to their college environment and their leadership capacity. In addition, it explores the role of ethnicity and other demographic variables as they relate to these constructs. “Currently, I’m working on co-writing up a paper about the findings of the study that we hope to publish next year,” said research assistant Courtney Chan. Outside of research and programming, KLI continues to support SOURCE, KLI’s non-profit consulting group. This semester they consulted with seven non-profit organizations in the community. Here is a client success story from Lili Muskal ‘19, Lead Consultant for Ophelia’s Jump, a local theatre company. “We advised them on content to compile: including intern testimonials, audience member testimonials, quantitative values of what each donation could provide. Two months later, [they did what] we suggested, and they have begun sending out solicitations to potential donors during the holiday season. They also posted the content online as a Facebook campaign yesterday morning. Just from the Facebook content (without in-person asks or donor gift boxes), they have raised $3,500 of the $15,000 goal in 24 hours,” said Lili Muskal ‘19. In addition to client work, SOURCE has hosted two Nonprofit Brown Bags lunches, connecting local nonprofit representatives with keynote speakers. Internally, KLI underwent a few logistical changes to foster a stronger sense of community within KLI. Student Coordinators have been replaced by Student Team Leads. These leaders are each in charge of a specific team. This specialization has organized management and communication within KLI student staff. The Team Leads have worked together to host student lunches, bringing together KLI student staff and SOURCE. Additionally, the KLI team bonded over the campfire stories and activities, during our first annual team overnight retreat. “This year, I feel like I really have gotten to know my team better, as a result of the student lunches and camping retreat. It has made our work environment more productive and cohesive,” said Institute Team Lead, Mitch Gaiser ‘18. We are looking forward to doing big things in the spring. We will continue to spread leadership through experiential and academic learning. To accomplish this, we have added new leadership course offerings for the leadership studies sequence in the spring semester. Dr. Sherylle Tan, Director of Internships and KLI Research will teach “Women and Leadership”. Dr. Scott Sherman, Senior Director of Social Innovation and Co-Curricular Programming, will teach “Making a Difference: Strategies for Solving Social Problems” and “Science of Making Life Better”. To extend leadership education outside of the classroom, KLI will host the 25th annual Kravis de-Roulet Conference focused on Inclusive Leadership. Additionally, we have a lot of experiential learning based programs on the calendar for next semester. “We are hosting another Passion and Purpose Retreat on January 27-29. Then, on February 11th, we are having a half-day workshop called “Storytelling for Fun and Profit”. This workshop is designed to empower students’ skills in communication and storytelling. During this program, students will reflect on their personal story, and understand what drives them. On February 24th, in partnership with the Women and Leadership Alliance, we are holding the Women and Leadership Workshop. The WLA workshop will give students the opportunity to network and receive practical advice from women leaders in a variety of industries,” said Programs Team Lead Jessica Azerad ‘17. KLI thanks you for being a part of our community and mission to make CMC the place where changemaking leaders are cultivated. We wouldn’t have been able to accomplish all we have done this semester without you. Your support enables us to pass the torch of leadership on to the next generation.